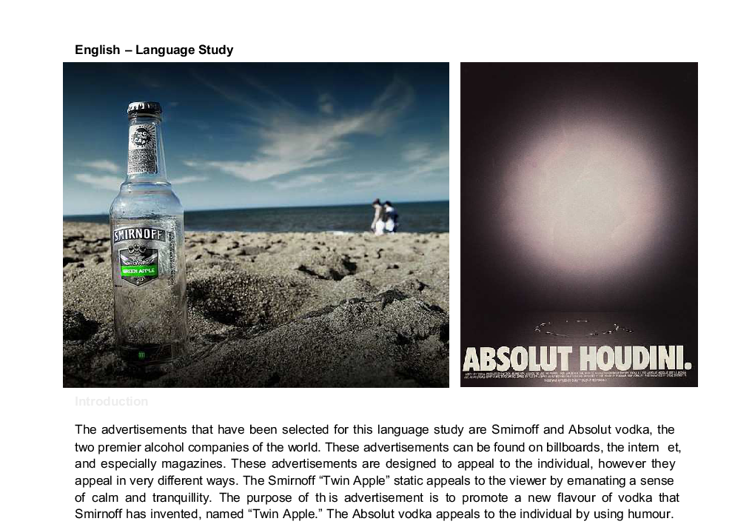 English - Language Study Introduction The advertisements that have been selected for this language study are Smirnoff and Absolut vodka, the two premier alcohol companies of the world. These advertisements can be found on billboards, the internet, and especially magazines. These advertisements are designed to appeal to the individual, however they appeal in very different ways. The Smirnoff "Twin Apple" static appeals to the viewer by emanating a sense of calm and tranquillity. The purpose of this advertisement is to promote a new flavour of vodka that Smirnoff has invented, named "Twin Apple." The Absolut vodka appeals to the individual by using humour. In this case, it replicates the late famous magician, Harry Houdini's disappearing act. The purpose of this advertisement is not to promote a particular flavour of vodka like Smirnoff's "Twin Apple," but rather to promote the already well-known brand of vodka, being Absolut. Paragraph one While both of the advertisements are for vodka, the intended target audience differs. In Smirnoff's "Twin Apple" vodka advertisement, it does not target a selected audience; rather it appeals to an array of viewers ranging from young adults to maturely aged men or women, regardless of social status. The part of the static that is able to capture a hugely varied target audience is the prominence and tranquil look of the bottle sitting on the beach. ...read more. The fact that the Abolsut advertisement directly incorporates the famed magicians name into the static, it directly catches the attention of viewers that are familiar with Houdini who may be hurriedly flipping through a magazine, or looking at a billboard. The humorous appeal to this advertisement of Absolut is what makes it able to connect to people of all ages, regardless of whether they recognise the name. It intrigues the viewer by omitting the photo of the vodka, and an explanation for it is given in two direct and simple words, a slogan which the viewer is likely to remember. The similarities between these two advertisements are that they both are promoting the consumption of liquor. The differences are that the Absolut appeals to a viewer's sense of humour and familiarity with the product, whereas the Smirnoff appeals to the viewer by its calm and serene appearance and the want for a carefree and happy lifestyle. Paragraph three The Smirnoff and Absolut vodka advertisments use different techniques in different ways to convince the consumer to buy the product. The Smirnoff advertisement is on a beach settings, with plain and natural colours that blend into each other. However, the colour that stands out the most is the labelling of the bottle, which is bright green. This contrasts with the entire backdrop of the static. ...read more. The effect of this on the viewer is that the eyes are deterred to two places, and if the viewer knows of Houdini than it is cause for a chuckle. 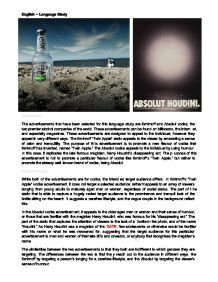 The language used in the static is short and straight to the point; "Absolut Houdini," which the viewer sees as a humorous homage to the late Houdini. The atmosphere that is derived from this advertisement is one of wonder and of confusion. Wonder at the missing vodka bottle, and confusion as to why it isn't there, with the question being answered by the slogan. The effect that this has on the viewer is that they are drawn to and intrigued by not only the atmosphere but the sheer oddity of the static. Conclusion The advertisement in which I think is most effective is the Absolut vodka static, for a large array of reasons. First and foremost, it is much more attention-grabbing than the Smirnoff static, because there is a spotlight shining on an empty stage, and this intrigues the reader to realise what is really going on in the advertisement. The optical centre is divided in two places; the empty stage and the slogan, and this, in my opinion, is extremely effective. It adds humour to an otherwise morose photograph, and is memorable in that not only is it humorous, but the viewer is subconsciously forced to remember the brand name. This Absolut vodka static is the most effective of the two, and is able to capture the reader's attention with just a flick of the page. ...read more. Using real-life characters in advertising get unsatisfactory results for businesses. The media use stereotypical characters as they impact on the audience and are convincing. Advertisers, such as Saatchi & Saatchi, and Bartle, Bogle & Hegarty believe it works much better to get models who fit the stereotype to pose in completely make believe scenes. It'll also make the evidence help with to solving the issue. Emotive language is included in the short story. Emotive language is used to seduce the reader such as, 'Only EU leaders can look us in the eye and say their code is tough enough!'. The woman is very attractive, with long hair, and wearing make-up to enhance her beauty and femininity. She is wearing a dress which is very revealing showing off her slim, womanly figure. Her lips are slightly pouted and her pose seducing. "Watch space craft zoom smoothly past you in 64-bit graphics." Out of the two adverts I definitely feel that Text A is the much better advert. It appeals to the reader more and I find it much more persuasive. Also the presentational features within text A are a great deal better than Text B. There are typical phrases presented in both advertisements. The 'Jewels of Aphrodite' silver 'Triple ring' advertisement has many examples of 'typical' phrases. 'For only �75.00' is very typical, trying to emphasise and give the impression that the asking price is 'only' a fraction of the true value. 'You need send no money now' is another example of a 'typical' phrase. http://www.bbc.co.uk/schools/sosteacher/answers/answer39999.shtml Although very different in presentation there is a strong sense of layout for both the advertisements. ADVERT1. Social Work it's all about people is very busy and cluttered with untidy handwritten type across each of the eleven images; only the low key 4 lines of information along the bottom right of the page is typeset.